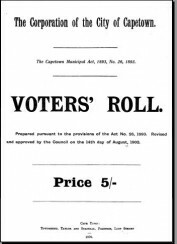 The Anglo Boer War had just ended and many households were changed forever but the business of life had to continue, This publication contains the names of those eligible to vote in the Municipal Districts of Cape Town (Districts 1 – 6). Eligibility to vote was based on property ownership and a person could have up to 3 votes depending on the value of the property owned. There are thousands of names represented in this publication and it is a valuable snapshot into property ownership in Cape Town at the beginning of the 20th century.